But who tries to solve the problems that firefighters face? It’s a challenge Callahan has taken up in the last few months. Callahan, who has been a Worcester firefighter for seven years, is acutely aware of the heightened risk of cancer faced by those in his field. Last summer, Callahan had a spark of an idea. And it came from standing next to a running firetruck. Studies have shown that exposure to contaminants during fires leave firefighters facing higher rates of respiratory, digestive, and urinary cancers. But health risks continue beyond the flames. Firetrucks leave firefighters exposed to diesel exhaust, which has been connected to health risks like respiratory disease and lung cancer. Scientific evidence has suggested a connection between lung cancer and occupational exposure to diesel exhaust emissions, according to the CDC. It led to the creation of a product he’s calling “the Calavent,” a chimney-like structure that connects to a firetruck’s exhaust pipe, carrying fumes several feet into the air and away from firefighters. The name is a play on Callahan’s last name. 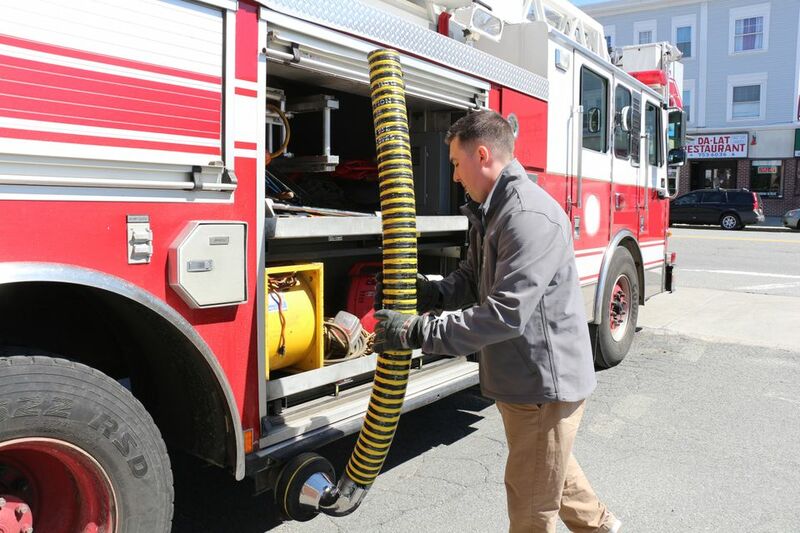 In Worcester, fire stations are equipped with Plymovent, a system that extracts exhaust from firetrucks, keeping the emissions out of the station’s apparatus bays and living quarters. “I kind of realized we have these tools in the station, why not build off of that and make it portable,” Callahan said. Callahan worked on the Calavent design in the garage of his Worcester home. It only took a few weeks to build, he said. The device in its current form uses a magnet to attach to a firetruck’s exhaust pipe. From there, exhaust is carried up a tube several feet into the air, above firefighter’s helmets. Ultimately, Callahan hopes that Plymovent or another parent company will pick up his product and put it out for mass production. Callahan said he has had conversations with Plymovent. Diesel exhaust is a mixture of various gases and fine particles, typically black in color with a low odor threshold, and contains more than 40 toxic compounds, according to the CDC and National Institute for Occupational Safety and Health, or NIOSH. OSHA has also studied diesel exhaust, suggesting that miners, construction workers, heavy equipment operators, bridge and tunnel workers, railroad workers, truck drivers and other workers can be exposed to dangers. Workers who are exposed to diesel exhaust can face problems and illnesses ranging from headaches and nausea to respiratory disease and lung cancer, according to OSHA. Callahan is making improvements to his product, which is patent pending. “It’s all about keeping myself and my coworkers and everybody safe,” Callahan said.